Exp 350: JR Casing Record! James (Jim) Gill, one of our intrepid repeat travelers, handed me a book yesterday and said: ‘Read the first paragraph.’ and then left. It was ‘Seabirds – an identification guide’, written and illustrated in 1983 by Peter Harrison. Jim knows that I live in Cornwall and has heard me talk passionately about this most beautiful of places. The sea is all pervasive: on a clear day, from some of the high tors of the Cornubian batholith moorlands, you can see the ocean on both the North and South Coasts. The deeply wooded valleys, populated by ancient fishing and mining hamlets, are separated from the surrounding water by majestic clifftops, strewn with wildflowers through spring and summer, and dotted with proud 19th century, granite, mine engine houses. But in winter the weather takes the glory! Cornwall sticks right out into the Atlantic and catches all the ‘sou-westerlies’ before landfall eases their edge. I too have stood on The Island in St Ives and experienced the thrill of this huge surge of energy, struggling to stand upright whilst watching the curtains of rain sweeping across the sea with anticipation, judging when was the right time to run for cover before the squall hits home. The sound of seabirds is a year-round backdrop in Cornwall, and because of its geographical location, the county is a honeypot for birders (or twitchers as they are affectionately known in the UK) waiting for orphans from across the Eastern US, Canada and the Arctic to arrive, battered and bruised, in our many wetland refuges. The Island in St Ives is actually a small rocky headland jutting out northwards and providing a superb haven in its lee for a myriad of sheltering fishing boats, people and seabirds in what must be the perfect harbour. We have been lucky on Expedition 350. We are early enough in the year to have avoided the cyclone season, and haven’t encountered weather that has anywhere neared the fury of an Atlantic storm (so far!). But we have seen a range of interesting birdlife while on this expedition, including Northern Pacific seabirds that only go to land to breed. It is truly incredible how these birds, with their delicate feathers and fragile bone structure, can survive for months out at sea, in fair weather and foul, and then find their way back to breeding grounds that may be no more than a pinprick volcanic island in the wide Pacific. Every night we can watch Bonin petrels skimming across the water right at the edge of the dim pool of light that spreads out from the flanks of the ship, picking off the odd vagrant fish that dares to surface. They are brilliant white beneath and dark above so they suddenly appear and then disappear as they turn this way and that. They feed only at night, hence I have never seen one during the day. Where do they go? We have also seen a majestic Black-footed Albatross (phoebastria nigripes), with its long tapering wings, circling effortlessly over the blue. (Photo: Wiki Commons) This species of albatross is one of three North Pacific species that breeds on a few islands in the Northern Pacific – most albatross species are only found from the Equator southwards. 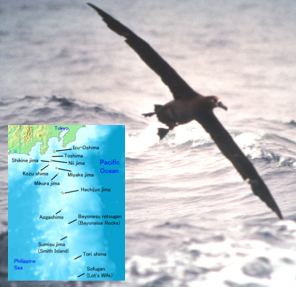 Nearly all the global population of the Black-footed Albatross is found on Hawaiian Islands, but small breeding populations survive on the Japanese islands of Bonin, Senkaku and Tori Shima. These islands are a chain of largely uninhabited volcanic peaks jutting out of the ocean, part of the volcanic arc that we have been drilling for the past 7 weeks, most of which is hidden beneath the waves. The chain separates the Pacific Ocean from the Philippine Sea to the west. The name Tori Shima actually means ‘bird island’ and it is a safe haven for breeding pairs of many species of sea bird, including 2 booby species – Masked and Brown. After fledging the albatrosses live out at sea for 3-5 years, riding the currents of air just above the water, and even sleeping on the wing, although they do come to rest on the water to feed and sleep too. After this time they somehow know how to find their way back to the very island where they were born – how they know where to go is one of those mysteries of nature that science has yet to understand! The Black-footed Albatross feeds in pelagic waters, taking fish, the eggs of flying fish, squid and crustaceans. It will also consume floating debris, including plastics, which is a threat to their continued survival. The Joides Resolution has very strict rules about what we do with all our waste: sorting it, incinerating anything that can be burned with minimal pollution, and taking all plastics, metals etc back to shore for recycling or careful disposal. Hopefully our occupation of this small corner of the ocean will not have had a detrimental impact on birds or any other wildlife. Indeed, we seem to have boosted the local population by becoming a temporary ‘reef’ and thereby bringing food (smaller fish) to the surface for larger fish and the birds to feed on!